IncuMax™ IC80, IC150, IC320, IC500 and IC850 incubators from Amerex feature a PID microprocessor controller and a forced air circulation system to provide both exceptional temperature uniformity and rapid heat recovery throughout its stainless steel chamber. 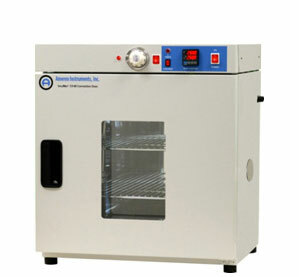 The incubators also feature an independent over-temperature thermostat that eliminates over-heating. The control panel is conveniently located at the top of the incubator. The door is locked when closed, providing a tight seal. A viewing window allows observation inside the chamber without opening the door. A heat-resistant silicone rubber provides a durable and effective seal. Two adjustable shelves are supplied with the IC80 and IC150, three with the IC320, four with the IC500, and six for IC850. An access port allows access by temperature probes into the chamber.